I was in my early twenties when the world-wide-web and, shortly after, mobile phones went mainstream. Sadly, this makes me old enough for confused teenagers today to ask me what the hell I did before the internet, their eyes full of pity for the years of nothingness I must have experienced until Facebook and Snapchat made life worth living. Apart from some mild envy of youth, I’m actually glad I was already an adult when the internet itself came of age. I got to marvel at the revolution and genuinely sensed magic around the potential we were being offered. Grow up with it and you know no different. Devices of that time now appear crude, but each generation was so different from the last and huge leaps were being made every six months, it was exciting at the time. Fast forward to today, is the leap from iPhone 6 to 6S really so great? On paper, maybe. But in real life, it’s a marginal improvement at best and any sense of magic has passed. I still love gadgets, but recently I’ve been hoping for something a bit different to leap out and rekindle my interest. My wish was quite literally granted over Xmas when the ‘Leap Motion’ landed in my lap, offering a new way to interact with my computer. So did it bring back a sense of that early magic and revolution? Let’s find out. Excuse the backdrop - a desperate attempt to put some detail into the shot! The hardware itself doesn’t give much away. Housed in aluminium and plastic and about the same size as a cigarette lighter, all the clever tech is hidden out of sight inside. And the tech inside really is clever. You’re getting a combination of infrared sensors and cameras that can recognise and track each of your 10 fingers to within a 100th of a millimetre. The equally clever software can then translate your motions and gestures into actions on the screen potentially allowing you to interact with digital space in a much more fluid and natural way than a keyboard and mouse, or even a touchscreen ever could. So it sounds like a great idea, but to be a great product, it needs to work well and either entertain or solve some problems. The folks at Leap Motion have wisely created an app store and made sure developers have had plenty of access in order to write dedicated apps to be brought together in one place for you to browse through. The Leap Motion works on Mac and Windows and in the app store I found both platforms to have roughly the same number of apps available, although each had a number of exclusives. Dominated by games, I decided to check out the entertainment products first. I started with ‘Flocking’. Not a game as such, more of a tech demo where a swarm of fish gather around or flee from your ghostly digital hand as the Leap Motion accurately tracks your movements. It’s simple, but beautiful to look at, but in reality you’d likely get bored within a few minutes. A good one to show your new gadget off with though. Next up was ‘Collider’ which I can imagine was inspired by the Large Hadron Collider. You fly through the surreal collider listening to electronica and interact with orbs and other shapes as you fly along. It’s a little confusing at times, but it’s also immersive and reminded me a little of playing ‘Rez’ if you’re a gamer. I think I could have played Collider for a little longer than a few minutes, but it was during this game that I discovered that interaction via Leap Motion isn’t perfect. The sensors of the Leap Motion combine to scan a 3D box above it and your hands need to remain in this space all the time. Any slight obscuring of your hands, or slip out of the box leads to very strange and jarring behaviour on the screen. As this kind of interaction is arguably more immersive, given that it’s working with your natural gestures, it’s immediately frustrating when your actions are not translated perfectly to the screen. It made me want to stop using it and that’s not just because my arms were tired. Instead, I decided to switch to something else. Google Earth is an incredible achievement in software and the idea of interacting with it via the Leap Motion, especially using flight simulator mode was especially appealing. Take a look at the YouTube video below showing someone who knows what they are doing. I got fed up with trying, no matter what I did, I just ended up looking at the sky. The Leap Motion could definitely bring something new to gaming, but it hasn’t got there yet. The majority of games in the app store are too simple to hold your attention for long or they just don’t play well in the first place. As a productivity tool, Leap Motion also shows some promise. I experimented with ‘Form and Function 3D’, which allowed me to interact with well animated human organs and ‘BetterTouchTool’ which can be setup to allow you to control your computer (a Mac in my case) with gestures. Given that Apple are never likely to give MacBooks a touchscreen, this may be the best opportunity there is to get away from the mouse on a fruit based computer. It works, but after a while, I realised I wasn’t solving a problem when the gestures on the MacBook's touchpad are so fluid and satisfying. 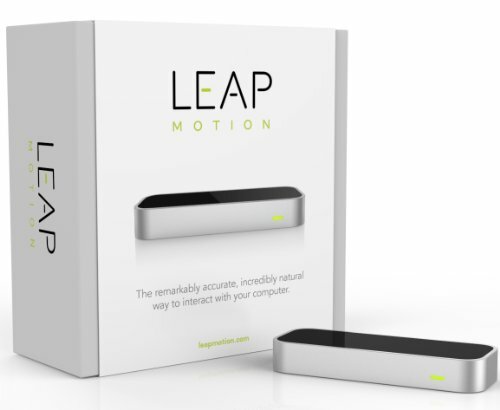 The Leap Motion is a great idea, which has been reasonably well executed. It’s hard to recommend buying one, unless you’re technical and want to experiment with writing apps for it. But I do see an interesting future for the technology. I’m pleased to see HP have integrated it into some of their keyboards, making it a nice extra interactivity option without feeling like you need to ditch the tradition keyboard and mouse. But more excitingly, it could solve a problem with virtual reality technology and that's where Leap Motion the company is headed. Whilst VR headsets have developed to the point where images are sharp and responses to your head movements are near instant – how will you interact with the digital world in front of you? Some makers are going down the route of game-controllers, but I think VR won’t ever feel totally immersive until you can use your hands properly. Leap Motion might just help them achieve that. So whilst our smartphones, tablets and laptops may have become a bit familiar, there is an exciting technology hitting maturity and that’s Virtual Reality. Don’t buy the Leap Motion just yet – but if you see it attached to a VR headset, leap at any opportunity to try it out.